The ladies of the Crafters Unit work very hard every day on a variety of projects including curtains, placemats, hand bags, aprons, pillows and more. These items are then sold at the Missionvale Care Centre as well as at Art in the Park the first Sunday of each month. As the women are taught the basics of sewing and become more adept at these skills they have an increased chance of becoming employed by businesses throughout the Port Elizabeth area. 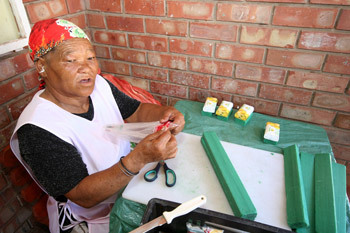 Once the crafters have been in the program for a while and have obtained the necessary skills, they are encouraged to look for work outside the Care Centre. Sister Ethel also helps them with start up equipment and costs if they are interested in starting their own small business. This is a great way to promote entrepreneurship among the people.